Imagine two youngsters playing with a kaleidoscope for the first time. One peers into the peephole and describes the colorful geometric pattern that changes each time he shakes the kaleidoscope. Though the fragments of glass in the viewing cylinder don't change physically, the patterns and designs created by them and described by the child peering into the peephole change with each turn of the cylinder. The kid not looking into the kaleidoscope must rely on his friend for accurate descriptions and probably wonders how the view in the small container can keep transforming itself into new forms and designs. The two kids with the kaleidoscope aren't that unlike a person new to alpacas who is trying to make sense of fiber evaluation after listening to a series of alpaca owners describe the importance of its various aspects. Like the glass chips in a kaleidoscope, the components that make up alpaca fiber are always the same, and like the designs in a kaleidoscope, the descriptions keep changing, each differing widely from one alpaca owner to the next. It's sometimes hard to remember that the words bantered about to describe alpaca fiber are new to most neophytes: handle, fineness, crimp, standard deviation, fleece weight, micron count, elasticity, resilience, and tensile strength. There are, of course, many more terms. If one wants to attempt fiber- jargon proficiency, he or she can delve into Von Bergen's 450-page Wool Handbook (New York: John Wiley & Sons, Interscience Publishers, 1963) or Wingate's 688-page Fairchild's Dictionary of Textiles (New York: New York University Press, 1967). The central challenge when discussing alpaca fiber in the North American context is to separate promotional jargon and partial descriptions from essential properties necessary for processing good-quality alpaca fiber. For example, the latest craze among North American alpaca growers is to hone their sales pitch around the seemingly irrefutable evidence of a micron test from a fiber-testing laboratory. People say things like, "My stud is 22.1 microns, and my good friend's stud is 24 microns." The implication is that the lower the count, the better the animal. There are, of course, a myriad of other factors that go into comparative assessments of fiber and even more factors involved in the assessment of the total animal as a biological being. Two realizations help bring clarity to a discussion of fiber. First, fiber needs to be evaluated in its totality, not in fragments. Fiber evaluation is much more than a micron test. It is the sum total of characteristics, usually not an isolated characteristic, that make a given fleece either desirable or less desirable. The second realization is that the priorities in evaluating fiber can be legitimately different depending on the needs of the person evaluating it. A processor in Peru will be interested in such things as handle, fineness, uniformity, color, and cleanliness. An alpaca grower needs to be cognizant of the processor's desires, but he or she will also be interested in factors that the processor won't consider. For example, fleece weight per animal is what pays the bills for the animal grower, not the processor. If the grower is marketing top-quality fleeces for a highly defined market, then handle, micron counts, colors, and other factors may emerge as important. Complicating the evaluation process, the properties desired may be different depending on how the fiber is used. There are different end uses: sweaters, scarves, skirts, suits, hats, rugs, and so on. Breeding animals whose fleeces will be applied toward a particular end use has influenced breeding practices in other fiber-animal businesses. There are also different requirements for the two most common methods of processing: woolen and worsted. The relatively sparse information available on particular aspects of alpaca fiber adds to the difficulty of evaluating it. Although the effects of processing on alpaca fiber are well known, solid information about alpaca fiber's biological properties and the animal's evolutionary history is absent. Experts sometimes fill the void with information on sheep's wool, which is often applicable but sometimes misleading. A review of commonly used terms, starting with objective criteria, is a good place for someone new to alpacas to start. Becoming familiar with the properties of fiber and their relationships is important. Let's start with sorting classes based on fineness and fleece weights. The relationship between these two properties are linked. Table 1 shows the Inca Group classification system based on fineness. 1 The term huarizo, normally referring to the alpaca-llama hybrid, is a fiber classification that may have no connection to an actual animal. 2 Llama should be considered a fiber class that may or may not have originated from an actual llama. About 6 percent of the fiber being processed in Peru is baby; the rest falls into the other categories. Much of the baby product comes from tuis (an alpaca's best fleece, from first shearing). The Alpaca Mark, the registered symbol for alpaca products, stipulates that a product must be of fiber 28 microns or less to qualify for the mark (see "What Is the International Alpaca Association?" in this issue). For most of this century, growers were paid for fleeces based on weight, not on quality, though in the last year Inca Group has been paying premium prices for baby or finer fiber. Fineness is important to any luxury fiber such as alpaca, but the alpaca grower needs to realize that fineness in itself may reduce fleece weights. Vicu�as, the finest of all camelids (12 to 15 microns) produce about 1/3 inch of growth a year, less than a half pound of fleece weight. Alpacas are capable of 6 inches of growth a year and produce a fleece weight of between 1 and 8 pounds annually. Generally, the lower the micron count, the lower the fleece weight. The heads-up breeder attempts to achieve high fleece weight with a relatively low micron count, accepting some sacrifice of fineness to achieve a suitable fleece weight. A vicu�a will yield about a pound of very fine fiber (12�15 microns) at three years of age. It will take about two years to regenerate its original coat length of about 1.5 to 2 inches. North American growers often evaluate fineness by micron test. Its results are useful indicators, but when it is being used as a comparative tool, other factors--age, diet, lactation, and other environmental factors, all of which greatly affect micron counts -- need to be considered as well. 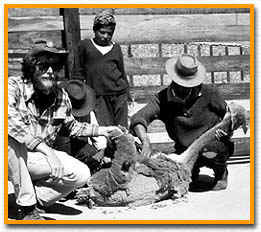 Peruvian animals tested at the end of the dry season cannot be validly compared with animals eating good-quality fiber in the United States; nor can a one-year-old animal with a five-year-old in the same herd. All comparative tests should be applied to animals in the same setting and at the same age. In reality, this requirement makes the comparative micron testing performed by North American breeders, with their characteristically small herds, somewhat questionable as a credible way to compare animals. Nevertheless, as a tool to track inheritability of fineness and fleece weight relative to fineness, micron testing can be a valuable tool. Staple length and density are two objective measurements that are important to the breeder and not appreciably important to the processor. 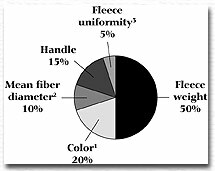 Fleeces with staple length of 2.8 to 4 inches are sufficient for most commercial processing. Cottage industry processing often has individualistic requirements. Density matters little to the processor. It's not important how many animals were shorn to fill an order. To the alpaca grower, though, these two properties are among the most important because they directly relate to the fleece weight produced by each animal. Good alpacas rate high in density (about like Lincoln sheep), and staple regeneration of their fleece ranges from 1 to 6.5 inches a year. Oddly, fleece regeneration is rarely talked about by alpaca growers, although it is an area deserving of more attention in genetic studies. Obviously, breeding animals that rapidly regenerate their fleeces would be an advantage. The fineness of alpaca fiber typically ranges between 20 and 28 microns but has a fleece weight of about 5 to 7 pounds if fed on good forage. Alpacas can regenerate up to 6 inches annually during the first years of life. The ancient Andean cultures that created the alpaca from wild camelids did an excellent job in breeding animals that produced uniform fleeces (archaeological sites have produced mummified alpacas with standard deviations of 1 [3 is considered excellent today]) and with the capability to regenerate rapidly and in weights far exceeding those of wild camelids. In the United States and Australia, alpaca growers breeding strictly for fineness sometimes lose sight of the balance between fineness and volume. Breeding solely for fineness may create animals whose fleece weights are subpar. For textile-producing purposes ,uniformity is a sometimes forgotten characteristic that breeders should attempt to produce in their animals. Defined broadly, uniformity refers to even distribution of all the characteristics that are valued in fleece: diameter, color, staple, crimp (or crinkle), density, handle, softness, and tensile strength. Uniformity of fineness with a very low standard deviation is particularly desirable, especially in animals that produce good fleece weights. Crimp and crinkle are a much emphasized aspect of fiber evaluation among some North American breeders, though their actual value in fiber processing does not appear to match the rhetoric in some regions. Some view crimp and crinkle as synonymous, while others apply crimp to the uniform waviness in a lock and crinkle to waviness in individual fibers. In most breeds of sheep, usually the more uniform the crimp, the finer the wool. This may not be the case with alpacas. Vicu�as, the likely progenitor and genetic link to the alpaca's ancestral past, have very little crimp though their fleece does have crinkle. Good-quality suris, by definition, have no crimp. In the mills of Peru, women sorting huacaya fleeces rely on their ability to judge handle (feel) to determine the quality of a fleece but don't pay a great deal of attention to crimp or crinkle. In the show ring in Peru, crimp holds no special advantage and takes a back seat to handle, fineness, uniformity, and density. The assumption made by processors is that most huacaya, with or without pronounced crimp, has enough resilience for processing purposes. To Peruvian processors and dealers, crimp's importance is secondary to qualities of fineness, length, strength, color, and, especially, handle. Perhaps this is because huacaya without crimp often has a great deal of crinkle and thus sufficient resiliency. Another objective quality is tensile strength (the measurement of fiber's strength before it snaps under pulling pressure). Obviously, if fiber is too weak to withstand the rigors of processing and normal conditions of human use, it is not very useful. Alpaca fiber is generally stronger than sheep fiber within comparable micron ranges. Bouts with disease and poor diet or health affect tensile strength. Elasticity is also an important physical property that can be measured. Subjective qualities are no less important than the objective qualities. In fact, when it comes to alpaca, the subjective qualities are what separates it from sheep and almost all other natural-fiber animals. Most specifically, handle carries great weight in any kind of serious assessment of both huacaya and suri alpacas. Handle is the feel and touch of fiber. In the mills of Arequipa, Peru, it is the single most important criterion in assessing fiber. Good handle feels pleasant to the touch; it's smooth, soft, airy, and unique to alpaca. Alpaca with undesirable handle might feel rough, brittle, or stiff. Becoming proficient in judging handle takes time and dedication. Executives in the large mills in Arequipa often say, "The key to alpaca processing is in the hands of the women who sort the fiber." Color, luster, and brightness are other subjective qualities. Color is perhaps the most intriguing. The multitude of alpaca shades (250 in eight basic colors), usually marketed as fifteen to twenty-two colors by Peruvian mills, sets alpaca apart from all other fibers. Ironically, mass production in Peru has emphasized white and fawn to the detriment of other colors and broad-based genetics. In today's Peruvian fiber market rare colors fetch premium prices. In a recent interview, Derek Michell, an executive at Michell & C�a, the largest Peruvian processor, suggested that North Americans should focus on high-end natural-color fiber to establish a special niche (see "Arequipa, Peru: Inca Group and Michell Laud ARI Screening Manual" in the Summer�Fall 1996 issue of the Alpaca Registry Journal). The use of color in marketing and the ways we as breeders work with color will be one of the great adventures of the North American alpaca business. Currently no genetics studies focusing on alpaca color exist, but ARI has just commissioned geneticist D. Phillip Sponenberg, DVM, PhD, to undertake such a study based on registry data. Below, a series of circle graphs (Figures 1�3) illustrate the properties found in fiber and the importance of various properties to the breeder and processor. Please note: The fractional sections in the graphs are arbitrary and do not represent a scientific study.However, the properties shown and the accompanying comments represent a condensation of valuable information for anyone wanting to think about fiber production in its totality. 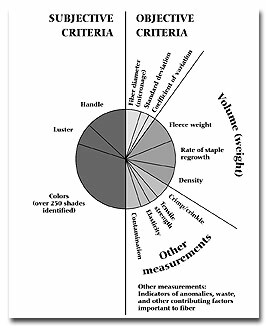 Alpaca fiber criteria for evaluation. Sizes of sections are for illustrative purposes and do not express percentage or relative importance of a particular criterion. Contamination: Important, but a husbandry rather than a breeding problem. Luster: Within a strain there is not a lot of variation in luster, so it may not be considered important. Tensile strength: We can assume this isn't an issue, because alpaca fiber does not break. adjacent staples is slight) are considered to have good style. Elasticity: Important in carpet wool, but for alpaca fiber end use, usually relatively unimportant. Density: Covered by fleece weight. Rate of staple regrowth: Covered by fleece weight. Coefficient of variation (CV): Covered by uniformity and to some extent by handle. Standard deviation (SD): Just a measure to derive CV. ARJ thanks George Davis for his analysis of the roles of fiber criteria. 1 Color equals pigment. 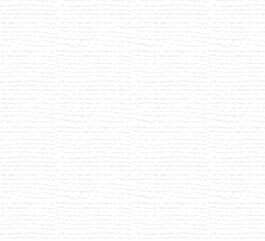 This may seem a statement of the obvious, but because virtually all sheep's wool is white, the term color in wool refers to "discoloration" of white wool. Wool of good color is pearl white, whereas wool of poor color has discoloration, usually a shade of yellow that often is caused by bacterial action. 2 Fiber diameter and handle are related. Usually the finest fleeces have the softest handle. The relative rankings reflect the view that if a coarser fleece still has a good handle, it is more desirable than a finer fleece with a poorer handle. 3 "Handle" refers to two different things: variation within a staple (measured by the CV), and variation in the fleece that affects the percentage of the fleece left as blanket after skirting. We hear about the former ad nauseam, but the latter is also important because of the variation among individuals in how far neck, leg, and belly wool encroach in the blanket. 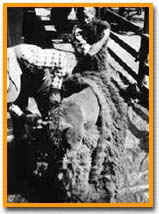 In sheep, the term hairy britch refers to a fault in which coarse fibers encroach into the fleece in the upper leg/thigh region of the fleece. 1 Handle is the primary means of sorting and classing in the mills. 2 Fineness is related to handle and the main determinant in establishing price. In the fine classes (baby, 20 to 22 microns; superfine, less than 26 microns), the importance of fineness increases because the tops in the finer classes sell for substantially more on the world market. 3 Color is an important variable in determining value. Seventy-five percent of the processed fleeces are currently white or off-white. The remainder make up the other twenty to twenty-four colors offered by commercial mills. Color has special markets, primarily the Middle East. 4 Suri of all classes amounts to between 5 and 7 percent of processed alpaca fiber. Colored suri is rare--less than 20 percent of all suri--and is sold sporadically to specialized markets when stores are sufficient for a transaction. Suri is primarily sold to Italy in pure suri tops. Italian processors produce products that are blends or pure suri. Most suri sent to Italy is destined for women's overcoats and suits. 5 Handle of suri fiber is as important as that of huacaya. Brightness is a determinant of quality included with handle. 6 Fineness is very important in pricing. Traditionally there was one class of suri at about 27 microns. Because of demand and changing market forces, some mills now have three fiber classes: baby, 20 microns; superfine, about 26 to 27 microns; coarse, 32 microns. Baby is not abundant. Thank you to Glyn Smith, commercial manager for Inca Group, and Miguel Meija, a well-known, longtime fiber expert in Arequipa and the general manager for Internacional De Comerico, for the information in this figure (phone conversation with author, November 22, 1996).